A posy on my desk represents the feast by my front door. Have you have ever seriously wondered if you are a late bloomer in life? Everyone else, after high school or college, seemed to sally forth confidently racking up accomplishments, yet for others of us, life unfolded more slowly, less surely. 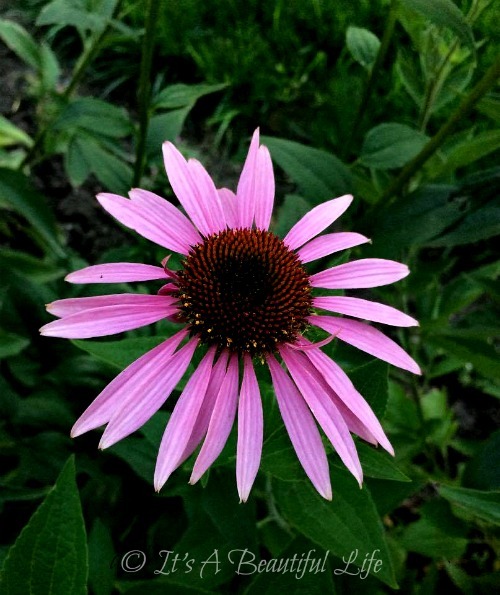 To some people it might have looked like we were late to our callings and careers, but in truth, our seed packets -- unbeknownst to all but One -- were labeled: "Plant early in Spring. Will bloom mid- to late-summer or early fall. Tall and widespread once mature. Plant to the rear of the garden or in a spot of its own. Blossoms are profuse; stake if necessary." Perhaps that's one reason why I love these late-in-summer charmers. 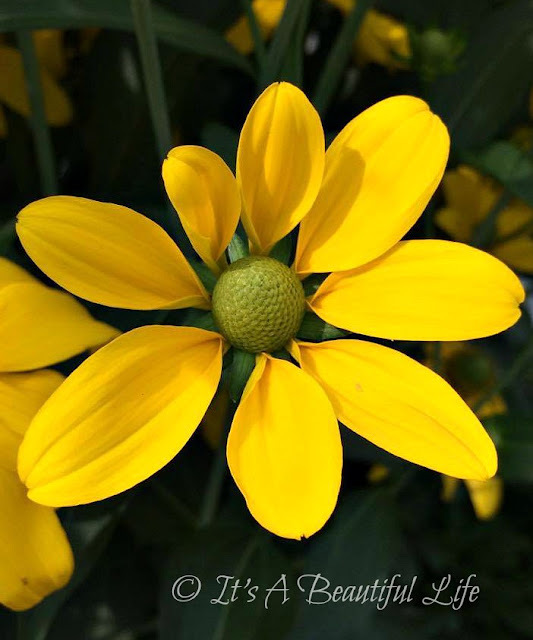 The early spring and summer plants have peaked weeks earlier and many are all but bloomed off by now, but then come the yellow black-eyed Susan (we call them rudbeckia) and the purple cone-flowers, just coming into full bloom. For the last two months, these perennials have been quietly growing tall willowy stems, thick and strong, and developing tiny buds, the promise of dozens of bright petaled cheer-mongers to come. And, now here they are ... ready for the grand display. How often I look forward to slipping out my front door and going back far enough away so as to get a more sweeping view. Two plants flank both sides of the bay window. 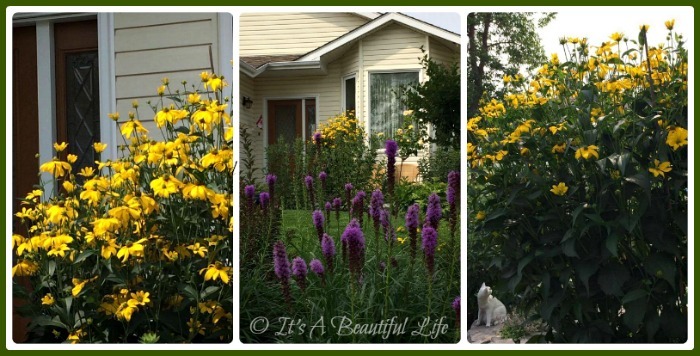 When I bought those two perennials a few years ago, I never dreamed they'd get that tall or bushy. 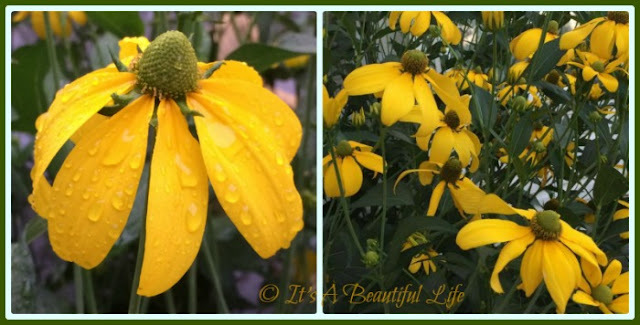 And, I certainly never dreamed that I'd find myself completely smitten by their bold beauty; I love to see them peeking in through the lace curtain of our living room window, swaying on a breeze or catching raindrops after the rain. No fussing, no rushing, no thinking because the lilacs were out so much earlier, they too should be setting blossoms already. No, the pressure to begin blooming earlier does not exist -- smart flowers -- yet inch by inch with patience and forbearance they are eventually ready to take their place in the garden's parade of blooming cheerfulness. Not late, on time ... making a garden beautiful in their own way and season. Just think, if everything in the garden came into bloom at the same time and then died back, how forlorn and empty would be our gardens the rest of the growing season. There are similar timings for our own gifts to come into their full blossom ... in the fullness of time ... in due season. I remind myself, too, some plants seem to die back after blooming early, but if you pinch back the dead blossoms, the plants put everything into sending out a beautiful second flush of blossoms. I completely identify with the quote above, for I have finally realized that I have indeed been preparing all of my life for this season. Sure hope I am like a wise flower and know when it's time to burst into full bloom. "This is your season. Flourish. Bloom. Do the work you've been preparing for all your life. An oak tree at 60 is still young, but it's no longer a sapling, green and immature. You always felt you were a late-bloomer. Yes, you were; your gifts needed to mature. Develop. Deepen. Emerge. including those Michaelmas daisies (not here but England). This, My Child, is your season. Harvest the garden and the fields. season with ease and grace. You don't need the strength you had at twenty. You're not doing that work out there. It is time to focus on your own life work. You've got a storehouse full. and ability to set it out to share with others. This wasn't the post I planned when I first sat down to work on something this month, but it's what bubbled up as I started uploading the photos I wanted to use. I see more clearly than ever that I first had to live my life with all its experiences and life lessons before I could sit down and write from it. You may ask, how is it going? Slowly ... one page at a time. Grace flows. Thankfully. A very thoughtful post. And thought-provoking. It's difficult to imagine a world that would only bloom in one season! Your skillful writing and 'teeny bit of musing' have revealed a truly lovely perspective of the late summer/autumn season, literally and metaphorically. Well done! we can see you have a magic hands, your flowers are blooming like crazy ! A lovely post Brenda, thank you. Kindred spirit, through and through. I, too, am a late bloomer, an autumn girl, who needed (still needs!) time to "develop, deepen, and emerge." Lovely post, Bren. Thank you. I think I am an Autumn girl, too. I loved this post, Brenda. Thank you for your wise ponderings! I can only agree...being 77 and still blooming, producing and helping other find their creativity! Lin, You are an inspiration! 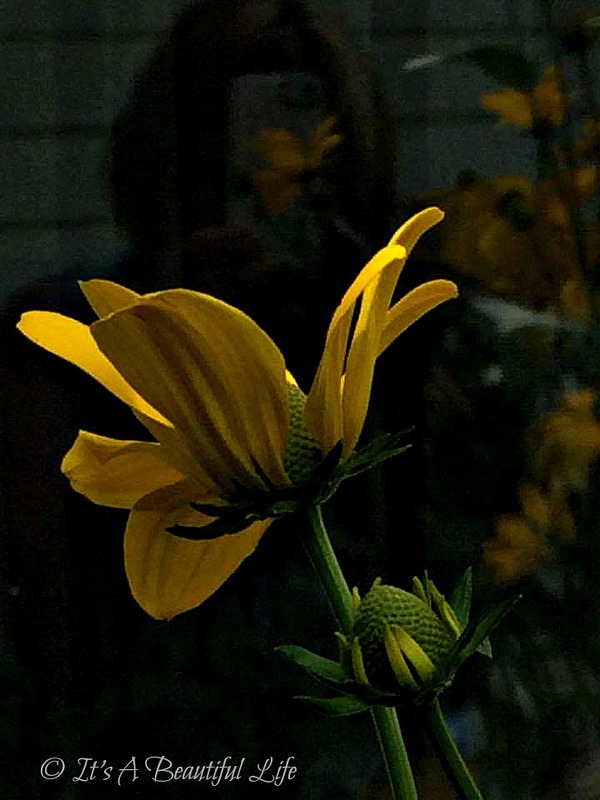 In my 61st year (but not officially until October), I, too, consider myself a late-bloomer. Your words affirm the process of maturation and growing deeper into life and love. Much to ponder here. Wow...so many of us (late bloomers) here. When I turned 60 almost 3 years ago, I claimed "Sixty is the new forty" as my slogan that year. I am literally a fall, being born in September and claiming it as "my" season as well. What a beautiful way to put becoming more...ahem...mature to words! Wonderful post, Brenda. Another late bloomer here! Thank you for the thought-provoking post, Brenda! I was just thinking yesterday, how I had been a late bloomer, but when God finally watered me to go for it, I bloomed with confidence in who I am as a child of the King. A lovely post as always. Lovely post, Brenda. Very beautiful, pictures and words. 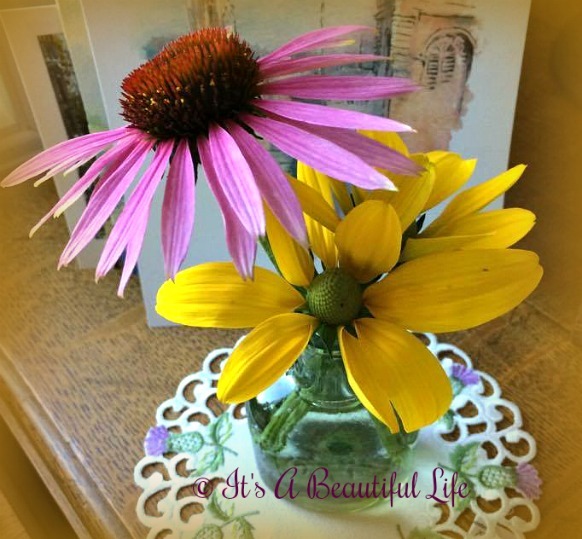 Dear Brenda - your post is so beautiful just like you. Because I am 60 and still searching and growing your words of wisdom touched my heart. Loved seeing your flowers too. Thanks for your lovely thoughts. Have a blessed day. Hugs! This is a lovely, thoughtful post! I love the idea that we can bloom at any stage of life and I believe it to be true. I am such an Autumn girl too, Brenda, and a late bloomer so this post feels like a message sent straight to my heart. I love these flowers too and just two weeks ago my husband planted 5 black eyed Susans as we didn't have any at our new house. I hope that they will grow as large as yours have. Spring flowers are exquisite but as our hot summer rolls on despite me wanting Autumn to arrive, just looking out the window and seeing these vibrant colors makes me so happy. All of your pictures are lovely but I especially love the last one and it does remind me to "lean toward the light." The autumn of our lives when we can once again enjoy doing exactly what we would like to do, it is almost like being reborn! La vie en rose. Enjoy it dear Brenda and we will enjoy it with you through your wonderful writing. Thank you. Ah my goodness Brenda, how I love this post. It truly speaks to me. Born in October, I am an autumn girl and also a late bloomer. Your beautiful words touch my heart and I will read this post again and again. Wishing you beautiful days, full of doing and enjoying all you love! gorgeous photos and beautiful, wise words. Bloom on, beautiful autumn-girl!